Summer is a time of fun and relaxation, but it can also be a time where children forget the skills they've learned during the school year. LearnBop has provided a great new way to practice and maintain math skills with their LearnBop for Families subscription. It's been a great math help from my girls this summer. 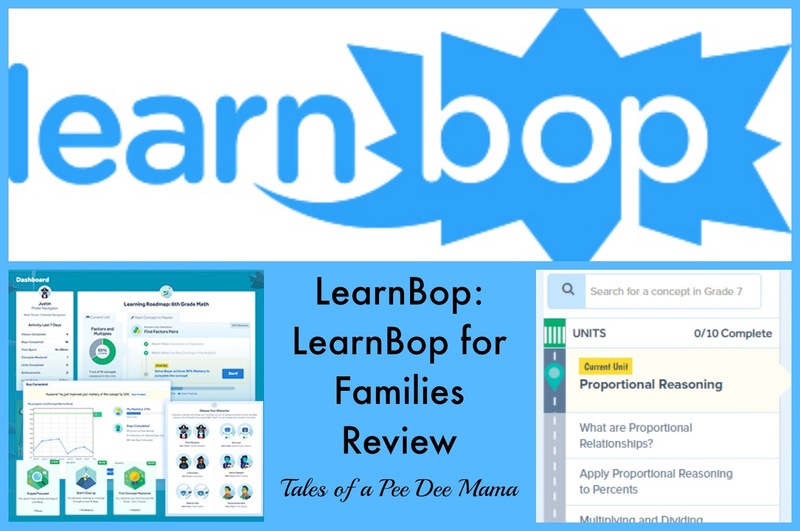 For this review, we received a twelve month subscription to the LearnBop for Families Family Plan, which provides access for up to 4 children. Since I have 4 girls who need to practice math skills during the summer, this worked out perfectly for our family. Because I don't want my children just sitting on their backsides watching Netflix all day long during the summer, I've established some guidelines for them. Before they can turn on the television, they have to read for at least 30 minutes and they have to work on math skills. So each morning, the girls take turns on the computer working on the LearnBop site. Once the girls' accounts were set up, they were able to select the grade level they needed to work at. I chose for them to work on the grade level they just completed so they could continue to review and practice the skills they learned this past school year. Each grade level (Grades 3 through 8) contains a road map - several units covering a variety of concepts. There are also road maps designed for working on specific concepts, allowing students to begin at a first grade level on that concept and complete units up through 8th grade. One feature I really appreciated was that, if a child changes her road map, LearnBop sends an email to the parent letting them know of the change. This way I can still know what my children are working on even if I'm not sitting right over them the whole time they are working on the program. I, as the parent, can go back in and place them back on the road map I want them on or I can leave them where they've changed to if I choose. I also like that they (and I) can see the concepts coming up on the road map. It's a good visual picture. At the beginning of the unit, the student does a warm up exercise. This exercise helps the program determine where the student is on that concept already. After doing the warm up exercise, the road map contains several video lessons covering the concept, followed by a section called SolveBops. In the SolveBops section, students complete problems on the concept. Once they reach 90% mastery in the SolveBops section, students can move on to the next section on the road map. I love that LearnBop utilizes a systematic approach to teaching and reviewing math concepts. My girls have been able to practice concepts that they need to remember for when we start school back in the fall. Another aspect of LearnBop that I appreciate is the parent dashboard. From there I can see the progress of each of my girls. The dashboard shows me how many videos they have completed, how many bops have been completed, how much time they've spent on the program, how many concepts they've mastered, how many units have been completed, how many achievements they've had, and their login streak. I can see which concepts (bops) they have mastered and their percentage of mastery. I can stay on top of their learning very easily with all of this information right there at my fingertips. Are you interested in what others have to say about LearnBop? Check out more reviews from the Schoolhouse Review Crew.